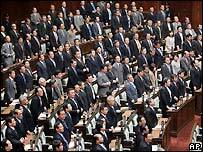 Japan's lower house of parliament has approved guidelines to amend the country's post-war pacifist constitution for the first time. The bill now goes to the upper house and if passed, a referendum on changing the constitution to allow greater use of military force will be held. Prime Minister Shinzo Abe wants to loosen the limits on military action. 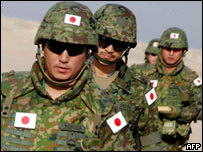 Foreign deployments of Japan's self-defence force, like that to Iraq, currently require special legislation. A military was formally banned when US occupation authorities drew up Japan's constitution in the wake of World War II. But the document has been interpreted to allow a self-defence force which has been deployed in some peacekeeping and humanitarian missions abroad. Mr Abe has made constitutional change one of his top policy goals since being elected in 2006. It is part of his efforts to make Japan more assertive on the world stage, with a military able to take part in peacekeeping missions overseas, says the BBC's Chris Hogg in Tokyo. Mr Abe has also said that Japan should remove its limits on collective self-defence and on helping allies under attack. Critics of the proposed change say that the pacifist constitution has kept Japan out of war since the 1940s, allowing it to avoid the militarism of the early 20th century and focus on economic growth instead. Supporters of an increased role for the military say Japan needs to play a greater role in the world and take more responsibility in maintaining global security. The Japanese troops despatched to Iraq were sent on a humanitarian mission, with strict guidelines to only shoot in self-defence. They were the first Japanese troops to enter a combat zone since World War II.